Life is like one big celebration made up of many small moments and a few big, momentous life-changing events. We love to share these big events with our favourite people—and when we do, we love to eat! It’s in our human nature to break the bread when we come together, and when you’re the one feeding the masses; you want to make sure you’re pulling out the above-the-average kinda nosh. So what’s a shoddy cook to do? Call in backup and leave it to the professionals, while you sit back with your pals, stuff your mouth with good food and drink, and forget about the washing up. Whether you’re planning a small get-together, wedding, birthday party, or any other shindig, here’s who we’re rating as 10 of the best caterers on the Sunshine Coast. Something for Catering truly does offer something for everyone. Available for any event including weddings, private parties, and festivals, their epic food truck is designed to feed and water the masses whilst looking so damn fine all at the same time. They work closely with local farmers, fishermen, and artisanal producers to create a luscious menu that incorporates a variety of ethnic and fusion dishes that aren’t just super tasty, but also seasonal and sustainable. What’s not to love about these guys? If you’re looking for one of the best caterers on the Sunshine Coast to provide you with a totally *wow* event, then this one’s in the bag. Spoon Fed Catering works in close collaboration with Bottle Fed Catering to bring you the highest quality of fine food and wine, as well as planning the whole event. A detailed plan is created for each and every celebration and is tailored to suit your individual quirks and needs. And, if you’re planning a wedding, they’ll provide you with a wedding coordinator to help sort out all the deets. Basically, you really can expect nothing less than a 5-star event. If you’ve ever tasted the amazing eats at Little Boat Espresso then you already know how good the catering will taste from Tuck Shop. Run by the same beautiful people, they also have a cute little food van that’ll cook you up some tasty food on-site. You can design your own menu, or go for their Little Lunch or Big Lunch options. These include yums such as hot smoked salmon, Okonominyaki green pancake with pork belly, popcorn chicken, black squid ink waffle, 10-hour slow-cooked brisket, roast beer-can chicken, 4-hour lamb, and more! With all things considered, this has to be the most unique catering menus on the Sunshine Coast. Brought to you by the owners of Gaston in Noosa, the Kitchen Shed are keen and ready to bring you and your peeps some quality modern Australian food—with a French and Asian twist. They cater for any occasion including weddings, birthdays, barbeques, feasts, beach parties, and more; and their diverse menu offers a range of hot and cold canapés along with some feasting mains covering everything from wagyu beef to seafood paella. They’re a flexible bunch and will even help set up your event and provide front-of-house staff, if that’s whatcha need. Totes up to you. You also have the option to consider Gaston’s in Noosa as a venue. Sounds pretty good to us! Run by a team who have cooked in some of Australia’s finest kitchens, The Rolling Dolmade serve up an enticing catering menu that epitomises our relaxed beachside lifestyle. With seasonal, sustainable, and flavoursome produce guaranteed, their catering options include a stylish cocktail menu; standing degustation (which we have to tell you—includes some crazy mouth-watering platters of Noosa regional produce); and a shared banquet, which is usually preceded by canapés and drinks and finished with canapé-style desserts. They will tailor the experience to be as formal or informal as you like—but whatever happens, it’s going to be a scrumptious affair! Without a doubt, The Rolling Dolmade is easily one of the best caterers on the Sunshine Coast. If you’re looking for something quaint and unique, Village Food and Events are bringing us some beautiful boutique picnics with fresh, handmade goodies inside. 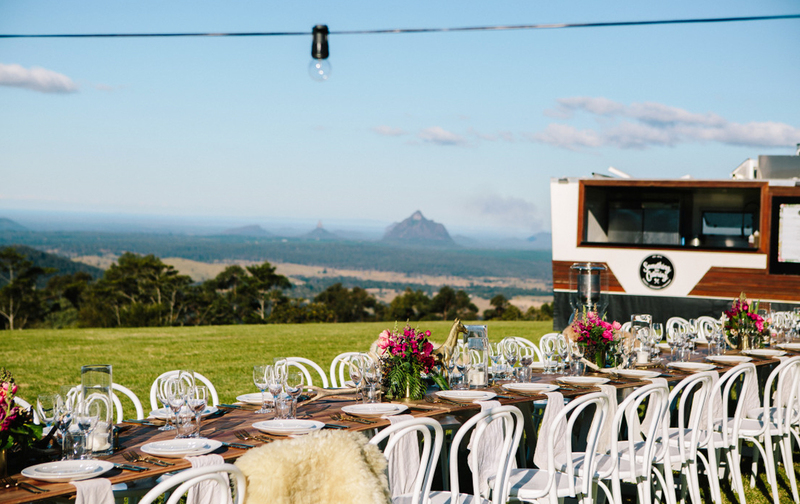 Served in vintage timber crates with cutlery, boards, menus, and more; their gorgeous picnic selections are sourced directly from Sunshine Coast farmer markets. Apart from being a taster’s delight—it looks so pretty too! Definitely one to consider. L&L Co. Events specialise in private property catering and will bring their fully-equipped mobile kitchen to you. Perfect for weddings, engagement parties, private parties, and corporate functions, their menu styles and options are both fun and elegant. Choose from their relaxed canapé menu, Bangalow pork and beef striploin spit roast, signature long table menu, traditional elegance menu, the dessert bar, or the L&L Co. High Tea Menu. So many options—not enough tummy space! Born from a whole lotta love for food and togetherness, The Canapé Project is an inspired catering company that guarantees an amazing food experience and encourages long, lazy eating with the people you love. Choose to create your own menu from a beautiful selection of skewers, seafood, meats, and veg options; as well as a cured meat platter and a big-bite menu (packed with pulled pork and beef tacos and tasty sliders); OR you can opt for one of their packages. Their Amazin’ Grazin’ package is perfect for a rustic-style wedding, with a grazing station set up on tallowwood tree buffet tables; packed with cheeses, meats, and more; followed by canapés, a main feast of interactive-style platters and big salad bowls to boost. If you’re looking for a great all-rounder, A Pinch of Spice is your dream caterer. They have every aspect of food covered to suit whatever event you may have planned. Choose from their MASSIVE range of canapés, boxes/boats with forks, late-night snacks (for the after party), food stations, picnic box deliveries (perfect for parties and corporate gatherings), shared plates, high teas, and more! Seriously, there’s not an aspect that these guys haven’t covered. Run by husband and wife team Daniel and Rebecca, Penfolds Catering believe in only sourcing the freshest and most sustainable ingredients on the Sunshine Coast. They have developed a variety of catering packages that would suit both a fancy formal affair, as well as a more modest, budget-friendly event. They have a range of package options including buffet menus, sit-down menus, stand-up finger foods, and affordable bamboo boxes filled with yummy things like Thai fish dumplings, deep fried calamari, Moroccan chicken tagine, and stir-fried gingered beef tenderloin. They also have a reputation for pulling out some amazing cakes. Which puts them way up there in our list of the best caterers on the Sunshine Coast.